Cherokee has been well-known for comfort and fashion since 1972. Recent nationwide surveys rank Cherokee in the top ten strongest brands for women’s apparel. 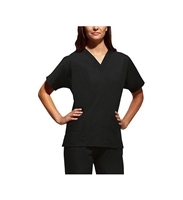 The fashion, comfort and quality of Cherokee medical uniforms and accessories and has helped the brand become the overwhelming favorite of healthcare workers in the United States. Dolman sleeve, v-neck tunic with side seam vents, two patch pockets and a cell phone pocket. Cherokee Unisex Medical Scrub Pants for school or work. Available in many sizes and colors.